What is the price for a tv repair service call? "What is the price for a TV repair service call?" This is an exact quote from our site's referral logs. In other words, someone landed at coppelltvrepair,com asking Google this exact question (which reminds me: thank you Google!). I've been asking myself a similar question for some time now, so I'll offer my take on it here. Mind you, I do not do service calls. Nobody here at Coppell TV Repair does and I doubt anyone will do, at least in foreseeable future. Unless you are either filthy rich or somehow handicapped I think the answer is "Probably too high to justify doing it." This puts a limit on the practically reasonable cost a repair technician can ask for the service. You have to understand, of course, that the price being asked is practically never "fair" to start with; it is just the highest the technician thinks he can pull out. I am not judging, I am barely observing. Well that's capitalism at work. From what I've seen most field's technicians prices are not determined by projections , yearly plans or anything like that. They are simply and dynamically adjusted based on market conditions, usually in the form of "replacement part cost times two". If that doesn't work a few times the correction factor is decreased, if it works well it is usually increased for the next customer until it stops working. Of course that also means that field workers can often pull out completely insane numbers and charge $300 for repairing a 42'' plasma from 2005 when one can buy a working one for $250 on Craigslist or , for merely $50 or $100 more, a brand new one at WalMart. Frankly, I think this is the second biggest reason why there are still any field TV repair technicians (the first being the filthy rich and the handicapped people - remember?). Yet the combined effect of decreasing TV prices and economy depression makes more people realize how impractical it is to pay 60% to 120% of the cost of a brand new TV to repair your old one. The most popular models - at least from what I can see - are switching from 32'' LCDs to 42'' and 50'' LCDs and plasmas. Lately, due to severe competition and lowering costs the manufacturers are making big push to promote widespread adoption of even larger models. While the 50'' are still somewhat bulky and heavy - particularly the plasmas - almost any LCD/LED TV up to 50'' can be fairly easily loaded in a car and transported to a repair facility. You couldn't have done that for a large tube TV in the days or with a projection of almost any kind. I don't talk about projections or tubes here as they belong to the past. If you have one you will probably soon be joining the flourishing society of owners offering them for free on Craigslist to whoever comes to unload it from the house. Every small company in China can now make or brand its own TV, which resulted in incredible variety of parts and problems on the market worldwide. Every trip to a house is increasing cots at least twofold; if a service is not successful from the first time it will break even at the very best if practically sane prices are applied, meaning a technician MUST solve the problem at first take. But all that variety of TVs and problems make it very expensive and very risky to diagnose the TV remotely and have the parts needed to replace on the spot when you go there once. As a service center we keep hearing this from technicians all over the place. It costs *a lot* to be able to do a service in one trip. And since someone needs to pay for this it is, of course, the customer. And since not every customer is so smart, the risk gets distributed - as much as possible - to all other customers, meaning once again that everyone gets to pay the highest price the technician can take out of them and NOT the price that would make sense in a more stable and predicable environment. This may be region specific issue, but here in Texas where customers are horizontally and not vertically distributed it is definitely a serious consideration. Plain and simple, the costs for covering an area have increased while the return has decreased as per the above. While prices have dropped , there's still no cheaper alternative from the do-it-yourself approach and now that economy has gone south more and more people are exploring that option.There are now tons of videos showing how exactly to perform a repair job on YouTube - not just for TV, but for mostly anything. As people got more used to Internet they inevitably start educating themselves how to do something rather than pay someone do it. As a result, new business flourish such as ShopJimmy or DiscountTVParts who are nothing other than modern junkyards, but that's quite enough since they know how to market on them web and that's what people want. Another bunch of businesses like Coppell TV Repair or TSM similarly move the classic repair shops to the 21st century offering repair services over Internet. In conclusion I'd say field TV repair technicians are a dying breed. It won't die overnight, of course, as there are many justifiable cases of using one, but the overall picture isn't good for them. And, for that matter, for anyone who uses them. "Quoted $400 to fix tv by repair man, you guys did it for $60! A+++++++++++"
Coppell TV Repair offers a repair service for power board MLT186 and as with many other services we sometimes receive boards that are actually functional. 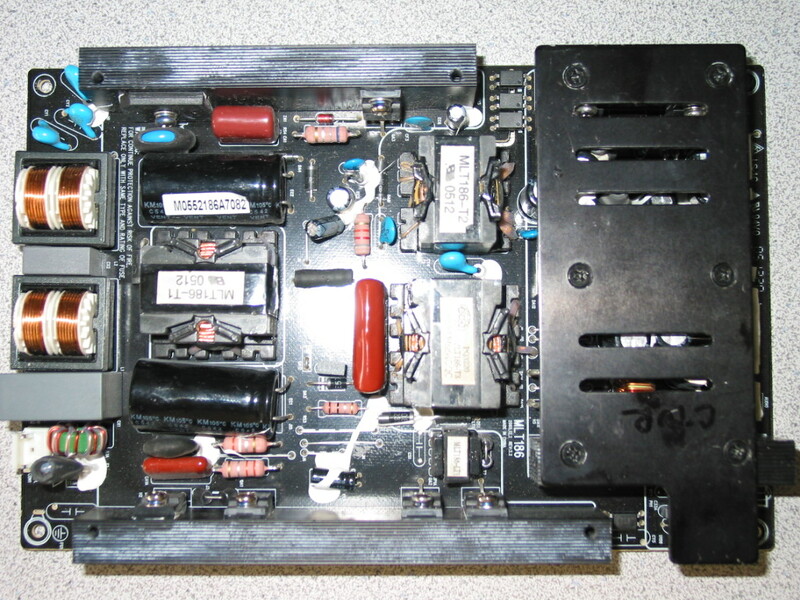 This post should help both those who wonder if their AKAI (or ILO) TV is dead because of the power board or the main board as well as those who receive a serviced power board from us and think it was not properly serviced. MLT186 is relatively simple as far as power boards go. It produces one standby (always on) output voltage of 5V and, upon instruction from the main board, activates another , more powerful chain of the board, which produces additional channels of +5V, +12V and +24V. All voltages are DC and all measurements are made with a multimeter in VDC measuring mode (dial pointing to VDC or V= sign), black probe touching any of the GND outputs or, if the board is mounted in a TV, any metal part of the chassis. The +5VSB voltage is called standby voltage as it is active even when the TV is in standby mode. It powers a small circuit on the main board, which is responding to the power button on the side and the remote control and when it detects you want to turn the TV off it sends back the +5V to the PS-ON pin on the same connector thus instructing the power board to wake up and get ready for work. The first thing to test in any power board is the presence of this standby voltage, so using the multimeter in VDC (or V=, which is the same) mode, hold the black probe to any of the GND outputs and the red one to any of the two +5VDC pins on CN4. A good test involves taking readings with both connector cables unplugged and then plugged; that can help determine if a power is working properly under load or failing to work under load. We'd recommend testing everything here without any other cables connected to the board other than, of course, the main AC cable on the other side of the board. Once the +5VDC voltage is there one needs to tell the board (signal it) to wake up the rest. 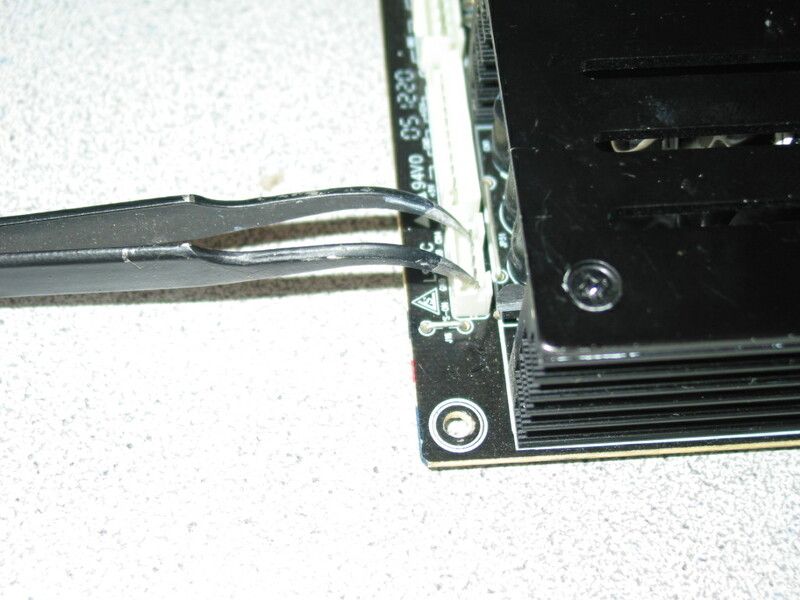 If that's hard you can just use a little jumper to solder the two opposite pins of the connector on the other side of the board. Once done, all other voltages should appear. 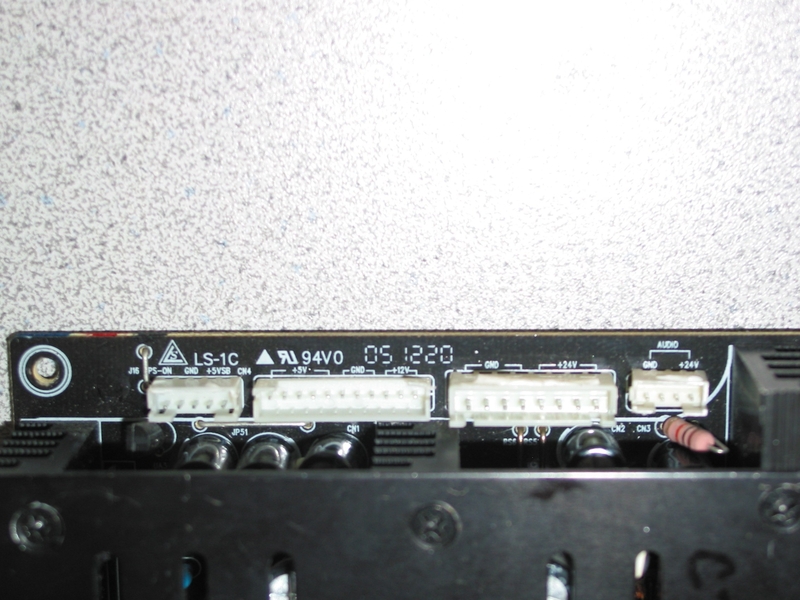 Note: audio output voltage may be +18V and not +24V as labeled on the board; that's OK as long as it is stable.